Jimmy Sellars of Sellars Project Space in Salida, Colorado is presenting my work in the Twitchell Building at 101N F Street. I am so pleased to see and offer my work in this beautiful space as only Jimmy Sellars could hang it. The reception on August 13th was terrific with a rich conversation with Mel Strawn, who will show there in the fall. I appreciate Mel's thoughtful understanding of the work. My dear friends, and forever collectors, drove their airstream Dot up from Forbes Trinchera and surprised me. Many other collectors and friends made the effort to get to Salida to see the Exhibition. I thank each of you. Thank you for noticing the groupings, enjoying the work, and posting your photos! Hanging out with Jimmy and Mark Monroe is always a treat. Here is the press release for the show. "Colorado artist Linda Armantrout continues the exploration of legend and spiritual partnerships. Through her symbolically charged animals and people as messengers of the power of Spirit, she paints from a state of exploration and experimentation. Her intention is to allow room in each piece for the viewer to find personal meaning and connection. Sellars Project Space is open Monday through Friday from 10 a.m. - 5 p.m. and always by appointment. Located within 2 1/2 hours from most major metro areas in Colorado, 3 1/2 hours from Santa Fe, and an 1 1/2 hours from Aspen. Known as the “Best Little Art Town in Colorado,” Salida is Colorado’s first designated Creative District. For more information on Sellars Project Space’s artists, programs, and community events visit SellarsProjectSpace.com or call (719) 221-9893." Much of the material that I teach connects to the art of abstract expressionists. For my students and any appreciator of paintings this will be a must see show! Thank you Gwen Chanzit and the DAM. "As you're making your summer vacation plans, you might want to include a trip to the Denver Art Museum for their exhibit Women of Abstract Expressionism, opening June 12 and supported by a grant from the NEA. While Abstract Expressionism brings to mind artists such as Jackson Pollock, Willem de Kooning, and Robert De Niro, Sr., only a few women painting at the same time garnered any name recognition, and even so, for many, this recognition came far later in their careers. Some, such as Lee Krasner and Elaine de Kooning, devoted themselves to managing their husband's careers at the expense of their own. Others worked outside the major art hubs far from the attention of critics. Thanks to the Denver Art Museum, many more of these prodigiously talented women will take their place in the spotlight." Click here to read more. Recently Cecily brown posted on Instagram the paintings of Sherie Franssen and alledged that Franssen was copying her work. The images are startling in their alikeness. Only Ms. Franssen knows the truth, but I became interested in reading more about Cecily Brown's compositions and the way she combines abstract and figural work. 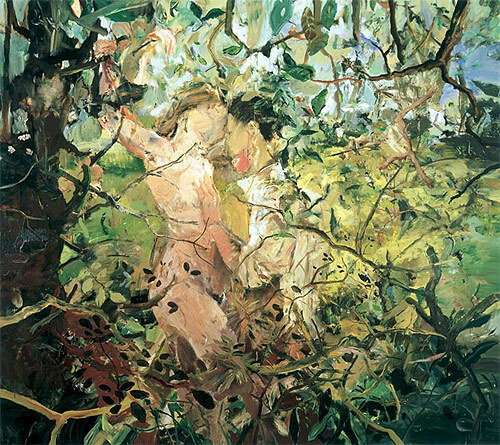 Here is a link to one article on paintings of Cecily Brown. A Facebook post by Susan Lucas yesterday lead me to explore. I recently found several interviews of Cecily on You Tube. They are terrific for learning about approach and process.